As a guest, you will be provided with an information book in which we have included a variety of events and activities you may wish to take part in or, you may be just as happy sitting on the verandah with a glass of wine and a good book. 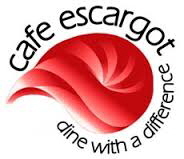 Treat yourself at the Inline 4 Café, Café Escargot & the Strzelecki Bakery to name a few! Walk or cycle through bushland along the Mirboo North-Boolarra Rail Trail. At Darlimurla, 6 km from Mirboo North there is a pick-up point at the old station site or you can continue on a further 7km to Boolarra. 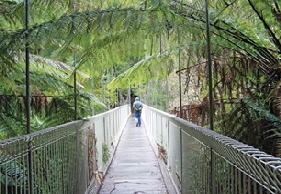 Walk along the 2km bushwalking track through the King Fern Gully in Baths Road Reserve. 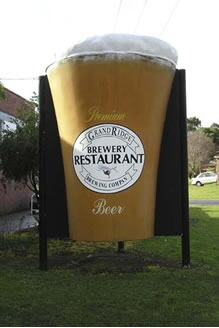 The Grand Ridge Road - one of Victoria's most spectacular drives, winds its way along the ridge of the Strzelecki Ranges for 132km through tall Mountain Ash trees and fern gullies. 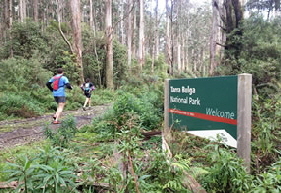 The drive encompasses the whole panorama of Strzelecki wilderness from Poowong in the west, through Mirboo North to Tarra Bulga National Park in the east. Wilsons Promontory National Park - one of Victoria's best known attractions at the southernmost tip of mainland Australia. The 'Prom' contains a 50,000 hectare national park with fantastic beaches, cool fern gullies, great views, spectacular rock formations, abundant wildlife and picturesque walking tracks. An easy drive through potato country to popular Yarragon where you will find arts, crafts, textiles, galleries, books and antiques. Vibrant arts and craft communities abound through the region. Visit one of the many galleries or stores throughout the area to view or buy quality products. Musicians and performing artists regularly showcase their talents at events during the year.